Back to Work – Hilda and the First Show of the Season Await! This has been one of those winters – one of those that the cold seems colder, the sky more grey than blue, and riding seems like a distant dream. Mother Nature dropped another 6 inches of snow on the region yesterday. The only upside is that when it snows in March in the mid-Atlantic region, it usually doesn’t stick around for long. In fact, by Friday, temperatures should be in the 60s – much more spring like. Given the fact that spring starts on Thursday, I’d say that we are due some 60 degree days. 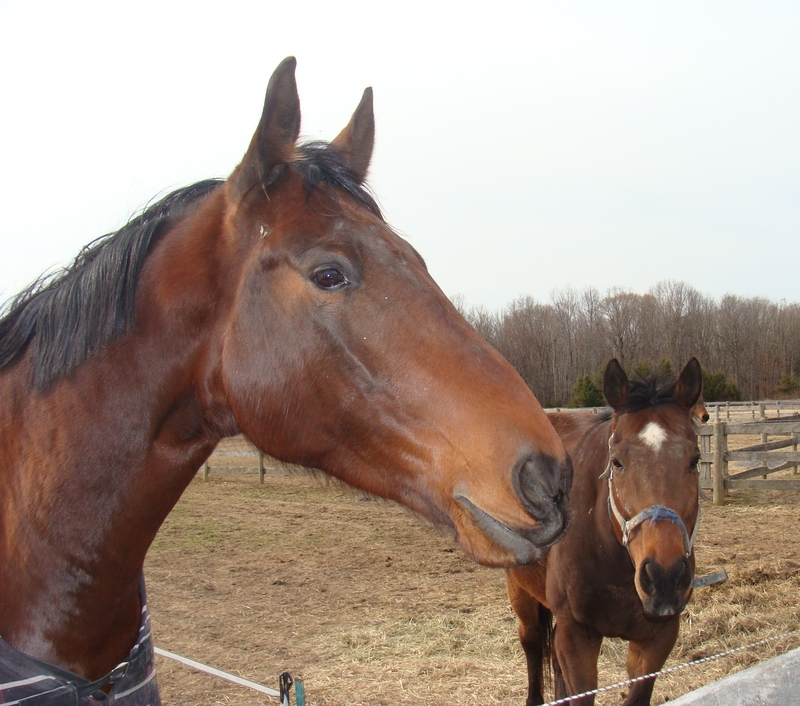 The boys would agree – they are tired of eating hay and would like some lush spring grass for grazing. I did luck out last week and managed to ride FIVE times with two of them being excellent lessons with Ms. C. I haven’t ridden that many times in a week since last December. It felt good to mount up and begin to re-establish our rhythm. It is amazing how rusty you become. It takes forever to find the training sweet spot and yet within a few weeks, you lose months and months of stamina and training. Ms. C asked me an interesting question at the start of one of my lessons, “If you are asked at the clinic with Hilda what you need her to help you with, what will you tell her?” [Insert sound of crickets chirping.] Umm, well, ah, yeah, I dunno…guess I need to give that some thought. Perhaps I need to refer back to George Morris’ commandments and just pick one of those. Ms. C suggested that I let her know that we are beginning our first year of showing First Level, so perhaps we should tell her that we need help becoming a First Level team. No more plodding around on the forehand or racing around like Scooby Doo. No longer is Ike allowed to ride a circle with a stiff and straight body; a circle needs to be more of a circle than a decagon. Guess whose job it is to make sure that he moves correctly? No more cruise control for this girl…one must ride every stride and plan for the movements to come. I suppose that means that my half halt timing will be closely scrutinized. And if my two lessons last week are any indication, my timing definitely still needs improvement! And speaking of close scrutiny, I have to admit, that while I am thrilled at the opportunity to be a demonstration rider at the Hilda Gurney clinic, I’m also a bit nervous. I am imagining hundreds of auditor eyeballs staring at my every move and looking for any and every mistake. That is more attention than I had at the regional finals! Yikes! “How did she get selected for this? Did you see her blow that half halt?! Look at her hand position! Ike’s head is so big and the ears belong on a mule. That poor horse could be great if his rider was more talented.” Yes, this is what loops through my head when I’m not busy with work or other tasks. I know that I need to stop the madness, but that is easier said than done. The money has been sent for our first show of the season as well. Our first show will be the first weekend of May. While there are shows in March and April, I knew that there was no way we were going to enter them. It is no wonder they call the show at the end of the month March Madness. You have got to be darn near insane to enter it since ride time has been steady practically nonexistent this winter. There is also an outlay of cash for the April clinic, so since there are not unlimited funds, the first show needed to wait. Call me insane, but I signed up for a couple of First Level tests. I guess if the one on Saturday is a complete disaster, I can always scratch my Sunday ride. I also signed up for a couple of Training Level tests just so that we have two rides that we can feel confident about as we head down centerline. Can Anyone Tell Me What a Sleepover Is? Hi Everyone! Ike here. I’ve hijacked Mom’s blog since she is apparently too busy to keep you updated on the goings on this week. She is very distracted getting ready for our first show of the season. She seems a bit more keyed up with this particular show that she was last year. I keep hearing the word “licensed” paired with the word show, but I’m still not clear what that means besides the fact that she has been harping about the money she has spent and is very worried about what the scores will be. Sheesh! All this fuss about a show overshadowed my 5th birthday on April 30th. Where was the cake? The peppermints? How about a massage? Where are my PRESENTS?!! All I got were some stinking carrots and I had to share them with my brother and barnmates. Uncool. Everyone tells me that I’m starting to look more mature and less like a baby. I might be looking older, but I still want a party. If I can ever figure out how to dial a phone, look out. I shall be calling the Humane Society to report this apparent lack of follow through on my birthday celebration. I have really been enjoying the weather this week. The recent rain and the warmer days mean that I finally have tender spring grass growing in my paddock. Yum. Hay is good, but nothing beats the first green grass of the season. My brother and I have been playing a lot over the fence which is tons of fun. I rear, Cigar does a rear/buck/cow kick, and then we run down the fenceline and do it again. Big fun. We got in trouble to getting a bit too rambunctious and pulling down the electric fencing. Cigar didn’t like getting in trouble, so he went and kicked down a fence board in protest. I just stood there and looked adorable when asked what transpired. Brothers have to look out for each other. Mom and I did two back-to-back riding lessons with Ms. C to try to fine tune us for the “licensed” show. More money spent that should have been used for an awesome birthday present. They seem pleased with how I’m doing. Thank goodness that she is finally figuring out the whole half halt timing. Mom keeps saying how much better our canter is this year that it was last April. Again, sheesh, what did she expect? I was only 3 years old when we went to the first show last year. My bet is that she wasn’t exactly the most graceful mover when she was 3 years old. You don’t get scarred up knees if you aren’t eating gravel every once in a while. My knees are still scar-free thank you very much. Hoping to come home from the show with some new ribbons to decorate my stall. Mom will fill you in on all those details on Sunday night. So who isn’t busy these days!? I keep constant lists of things that need to be done at work, at home, and in the yard. List of gifts to buy and people to call. I have shopping lists and menu plans to use the food that I purchased before it goes bad. I have lists of show dates and the dates that entries open. I keep a small notebook in my purse at all times so that I can jot down something at any time – sort of old-fashioned that way – I’ve tried some of the phone apps, but none are as convenient as my little notebook with its tattered edges. The lists help keep me focused and efficient. It is the only way I can manage to fit everything in and still get some sleep so I can function and do it all over tomorrow. Since barn time is limited, I try to keep my tack organized and my grooming routine as short as possible to maximize saddle time. That is my game plan. My horse however likes to derail those plans from time to time to remind me that I cannot control everything though I try and try. Temperatures have started a warming trend which means that since Ike is not clipped, he can’t wear his winter sheets and blankets. That leaves a very large mass exposed to the elements….and by elements…..I mean the M-U-D. Yes, that is right, mud season has already started in the mid-Atlantic region. Ike decided that he should partake of this early spring mud to “condition” his coat. Except for the front of his head and his ears, almost every square inch of his hulking body was covered with caked, dried mud. So much for more saddle time. By the time he was clean enough to ride, I was dirty enough to not want to ride. Well played Ike. While my time in the saddle was going to be limited, I was going to get in the saddle. Lucked out that the four-wheeling children were not out terrorizing the neighborhood, so Ike and I had a productive 30 minutes. Started out long and low at the walk and trot to really get Ike to stretch over and use his back. I then picked him up and worked on our square turns, circles, shallow loops and centerline turns. Hmm, those centerlines are a bit wavy right now. Need to start practicing them more to get back into show shape. If I am going to fork over almost $180 for two tests at a licensed show ($40/test+drug fee+office fee+GAIG fee+haul in/stall fee), we’d better bring our A-game. Our circles are good since we use them regularly, but our shallow loops are too abrupt rather than flowing. Will add those to the list of things to practice. And speaking of practice, Ike and I finished our ride by practicing Training Level Test 1. Overall, I’d say we gave a 63-65% effort. I think I remembered it from last year which is one less thing to add to my list. Fingers crossed that tomorrow is more time in the saddle and less grit in my mouth. Ike is well on his way to being the biggest horse at the farm. A few more groceries as my farrier would say, and he will be the undisputed title holder. 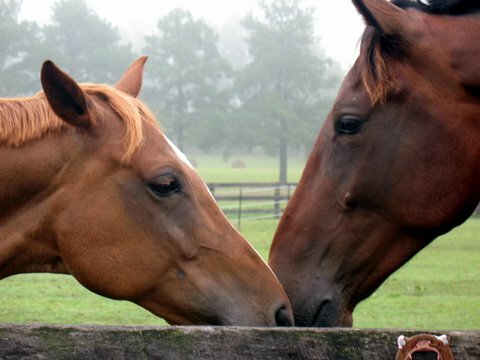 So I ask you: why is it that the biggest horse wants to occupy one of the smallest spaces? 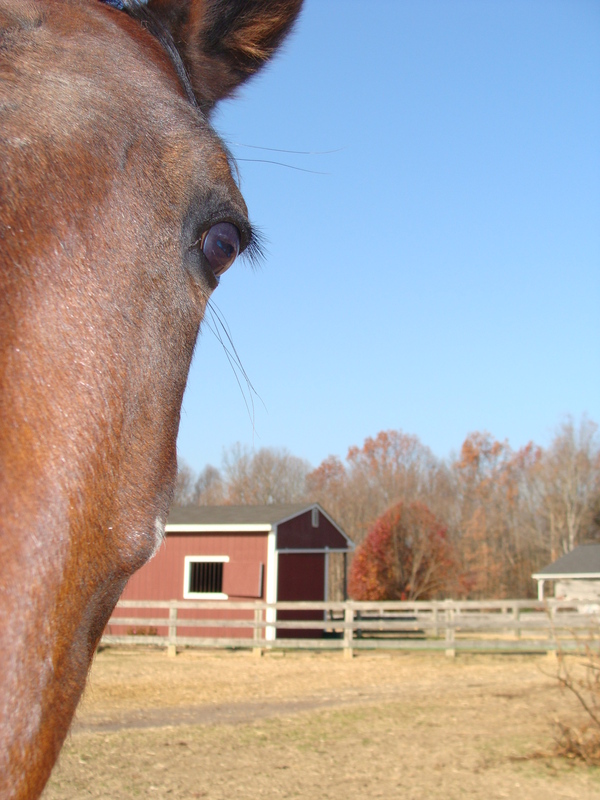 He has a lovely paddock that is green with spring grass. His best friend Lady is in the paddock next to his and he is tall enough to reach OVER the hot wire to visit with her. On any given day, he will pace and pace until he is back in his 12×12 stall. 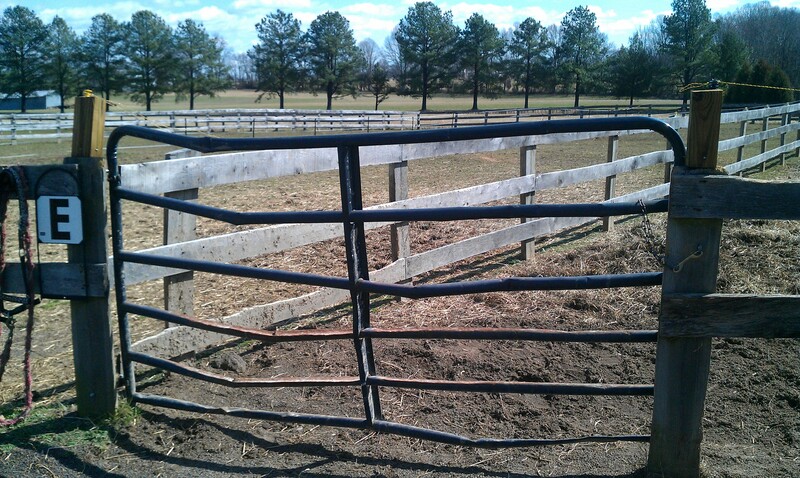 He used to crash into his gate or rear and take it off the hinges before we ran hotwire over the new one. Here is the old one as it held on for dear life. It is now in a mangled heap headed for the landfill. There is no rhyme or reason as to why we cannot stay outside on a clear, sunny day. Some days there is wind, some days none. Some days there are hawks, and on others only blue birds flitting past. There are very few bugs compared to summer. 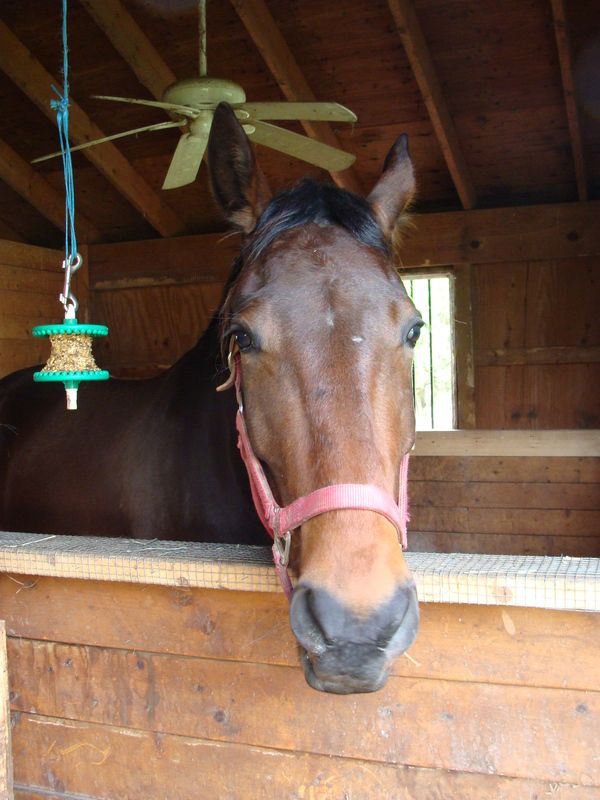 The best guess is that his stall is a sanctuary for him – kind of like a dog that has been properly crate trained. He has alfalfa pellets in his feed bucket, hay to munch, an Uncle Jimmy Lickit toy, and one of my husband’s old work boots to nose around. He has only the radio to keep him company, but he doesn’t seem to mind. I just smile to myself when I walk in and realize that he is patiently waiting for me to arrive. Life is good.